Coconut oil is rapidly growing in popularity for a wide variety of uses and benefits. For everything from cooking to moisturizing skin, this miracle oil tops the list of natural alternatives to improve your health and well-being. Whether you decide to start eating coconut oil, swishing it around your mouth or topically applying it to your hair and skin, coconut oil is something you need in your home. One of the greatest applications of coconut oil is for your hair, whether it be to intensely moisturize and condition, to stimulate faster growth, detangle, defeat dandruff and more. Here are six reasons you should start putting coconut oil in your hair. – Wash your hair and let it air dry while you prepare the next steps. – Gather your materials: a comb or hair pick, shower cap or small towel to wrap your hair in, two small bowls of different sizes (one should fit inside the other), and of course your jar of organic virgin coconut oil. – Scoop a small amount of coconut oil into the smaller of the two bowls. – Set the smaller bowl in the bottom of the larger one. – Fill the larger bowl with hot water so the smaller bowl is partially submerged, but not floating or taking on water. – Once your coconut oil comes to temperature and is completely melted, use your fingers to gently massage the oil into your hair, then work through with a comb or hair pick. – After you’ve finished applying the oil, wrap your hair up in a shower cap or small towel and allow it to soak in for thirty minutes or longer. – Shampoo to remove oil. – Optionally, you may reapply a small amount of coconut oil to the ends of your hair and / or work a small amount through all of your hair again – just enough to give it a healthy shine. – Then style as usual. – Gather your hair brush, a comb or hair pick, two small bowls of different sizes (one should fit inside the other), and your jar of organic virgin coconut oil. – Scoop a small amount of coconut oil into the smaller of the two bowls and set the smaller bowl in the bottom of the larger one. – Let your coconut oil come to temperature so it is completely melted. – Use your fingers to gently massage the oil into the ends of your hair, then – starting from the ends and working your way toward the roots – gently work out tangles with a comb or hair pick. – Let the oil soak in, then brush and style as usual. No need to rinse or shampoo. Coconut oil will continue to nourish your hair all day long! – At the end of the day or shortly before bedtime, wash your hair with an all natural shampoo and condition as usual. – Gather the following supplies: a comb or hair pick, two small bowls of different sizes (one should fit inside the other), a towel or cloth to cover your head overnight, and your jar of organic virgin coconut oil. – Scoop a small portion of coconut oil into the smaller of the two bowls then place it into the bottom of the larger bowl. 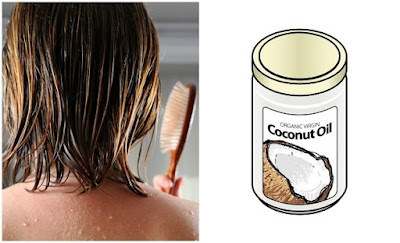 – While you wait for your coconut oil to come to temperature, use your comb or hair pick to remove any tangles. – Wrap your head with the towel or cloth and leave coconut oil on your scalp overnight for best results. Coconut oil makes an excellent medium for mixing your all-natural hair coloring. Because coconut oil penetrates hair more deeply and faster than many other natural oils, it can help your color to be more vibrant and keep it from fading too quickly. – Gather your materials: a shower cap or small towel, a comb or hair pick, coloring herbs, gloves, two bowls of different sizes (one should fit inside the other), a container for mixing color, and your jar of organic virgin coconut oil. – Scoop a few spoonfuls of coconut oil (enough to liberally coat your hair) into the smaller of the two bowls and set it into the bottom of the larger bowl. – Mix coconut oil with your coloring herbs and apply as you normally would. – Once color has set, shampoo hair with lukewarm water to remove excess oil and colorant. – Wrap your hair with a shower cap or towel to let color continue to set overnight. – Use your fingers to gently massage the oil into your hair then brush and style as usual. Healthier Eyelashes – Fill a roller bottle with fractionated coconut oil (coconut oil that remains in liquid form) and apply to your eyelashes at bedtime after having removed your makeup. If it is too oily, use a clean cloth to blot away any excess. Do this treatment 3 times a week for extra lubrication and nourishment. Fuller Eyebrows – Apply a few drops of melted coconut oil to your eyebrows with a clean fingertip to soften and thicken your eyebrows. Shaving – While all of the above methods discuss using coconut oil to improve the condition of your hair, it can also work as a great alternative to shaving cream to remove hair from your body. For shaving legs, simply apply a tablespoon of coconut oil to each leg and shave as usual. It might be wise to wash your hands after applying to prevent the razor from slipping out of your hand.